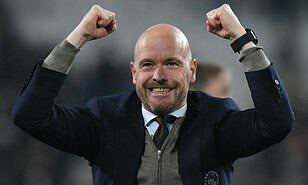 Ajax Amsterdam coach Erik ten Hag said his team would keep ‘pushing boundaries’ after they brought a breath of fresh air to the Champions League by reaching the semi-finals on Tuesday. Having knocked out Real Madridwith a 4-1 win at the Bernabeu in the previous round, Ajax came from behind to beat Juventus 2-1 in Turin and complete a remarkable 3-2 aggregate win in their quarter-final. ‘This team grows and grows. We know how to push boundaries every time. And with Tottenham or Manchester City there will be another challenge. We look forward to it,’ said Ten Hag, whose side face one of the English pair in the next round. ‘This is enjoyment. We had to survive their storm in the beginning. We had a hard time coming out of the pressure, but allowed Juventus almost nothing. Despite the presence of the world’s top players and coaches, Europe’s flagship competition has been in danger of going stale over the last decade as it has become dominated by a handful of big-time signings.